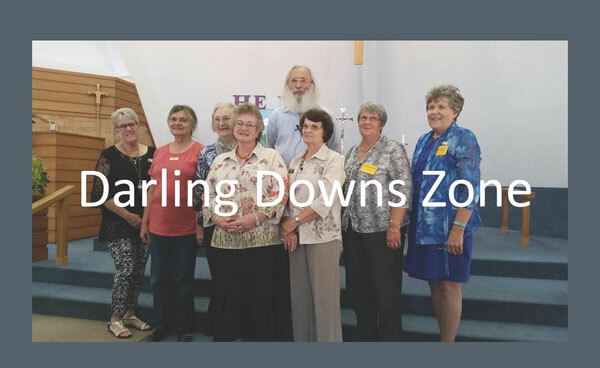 Darling Downs Zone Lutheran Women’s Fellowship Day Report. 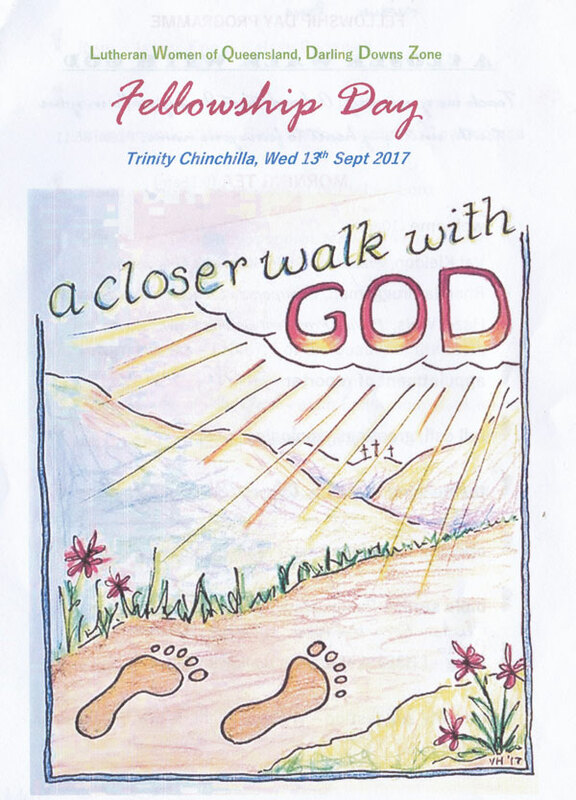 The ladies gathered at Trinity Chinchilla on Wednesday 13th September 2017, around the Theme of “A Closer Walk With God”. A very warm welcome was given by the Chinchilla Women’s Fellowship President Val Kleidon. Val shared that the last time the ladies had gathered at Chinchilla was in April 2009 for the DDZ Rally. 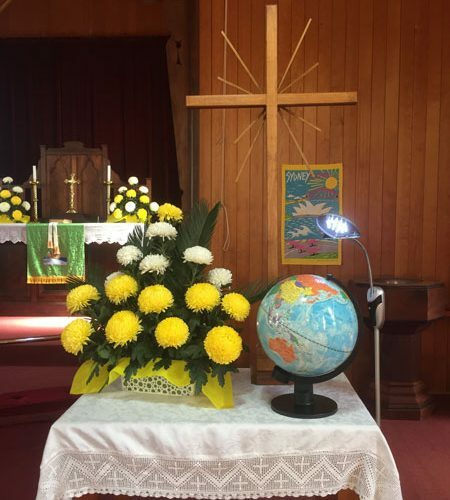 Rhonda Bruggeman Trinity’s Chairperson welcomed all and shared how the song ‘One Day at a Time, Sweet Jesus’ had come to her early this morning and then her thoughts and family issues drew her to remember “What a Friend We have in Jesus”. Hazel Weise was standing in for Meryl Rosenberger President, who was unable to be with us today. An explanation of the DDZ Banner was given, plus a welcome to all members and visitors, all of the DDZ executive were introduced. The Roll Call was taken with 47 DDZ Members, 3 LWQ Ex, 1 Pastor, & 18 Guests. A greeting was received from a Past DDZ Ex Member and Pastor’s wife of Chinchilla Tracy Smith. She is now on the South Aust Ladies Executive. The theme Song “A Closer Walk with Thee” was sung with great gusto. We were then entertained by the beautiful playing of the flute, organ and singing, 3 items from Jenny and Erin Redgwell. Pastor Mark Hampel led us in the opening Devotions from the OT Book of Ezekiel, and his vision by the Kebar River in the land of Babalyon. There was a big gulf between God and man but we hear from God’s word in John 17:24.“Father I want those you have given me to be with me where I am, and to see my glory, the glory you have given me because you loved me before the creation of the world. The Bible Study continued on from the opening Devotions looking at the people in Ezekiel’s time and what does Ezekiel teach us about a closer walk with God? We heard of God’s power to rescue all his people, Luke1: 78&79 Because of the tender mercy of our God, by which the rising sun will come to us from heaven to shine on those living in darkness and in the shadow of death, to guide our feet into the path of peace”. We closed this part of the day with the singing of “Let us ever Walk with Jesus’. LWQ President Karen Bryce gave a report on up-coming events. Pastor Hampel shared a number of important points from a report from Bishop Paul. Apologies were received from Bishop Paul, Pastor Robin Hoffman, LWQDDZ’s Spiritual advisor, who will soon be on long service leave and Meryl Rosenberger, DDZ President. The offering for the day was collected, 1/2 Angel Flight & ½ LCAQD Disaster Fund, $908 was collected. Jenny Stollznow on behalf of Toowoomba Churches Together, shared information of their planned Reformation Service to be held at the Armitage Centre in Toowoomba on Sunday, 22nd at 4pm-9pm, everyone’s invited. 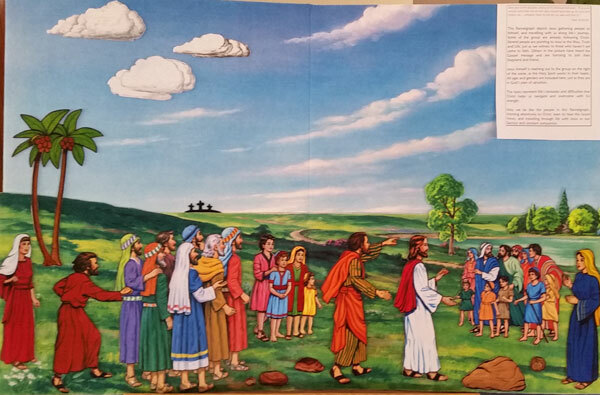 Instead of the usual banner to display the theme Chinchilla Ladies chose to use Flannelgraph, it depicted people walking along in their daily lives and Jesus was also there, it was very colourful, lovely display. After Grace everyone enjoyed the time to eat and catch up with each other the afternoon session began with praise time where we enjoyed singing, Walking Down the Road The Promised Land, Trust and Obey, Walking in the Light of God, The Way is Low, and Thy word is a Lamp followed by return thanks, For the Beauty of the Earth. “Our Walk with God”, most Guilds/Fellowships shared their groups walk with God. Chinchilla, shared by Val Kleidon, They began on 11Feb 1958 with Jean Jarrick as President. 14th Feb 1967 they had 37 members they now have 17. Apart from a monthly Guild day they hold Bible Studies, run a Friendship Club, when it began the older women baby sat, now it is mostly an older group but a great outreaching group to the community. Dalby thoughts, spoken by Shirley Horrigan, how our walk with God is closer even more when we have troubles, and when we gather together as sisters and Pastor around God’s Word each month plus chatting and cuppa’s. Also as God’s spirit leads us closer, make a difference in the world, hands to do His work: to stand up when there is injustice, to love as He loves and by the power of the Holy Spirit, that our desire, be a closer walk with God. Glencoe, Phil 3:2 They have 8 precious Members, they support each other in all circumstances, they send cards, do visits, pray. Matt 26:40 – practical ways of serving God thus having a closer walk with God. 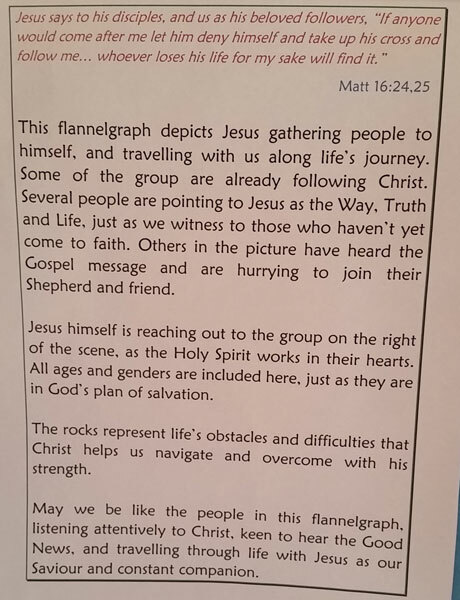 Also encouraging the children and youth to lead worship therefore encouraging them to also have a closer walk with God, this was shared by Val Kath. 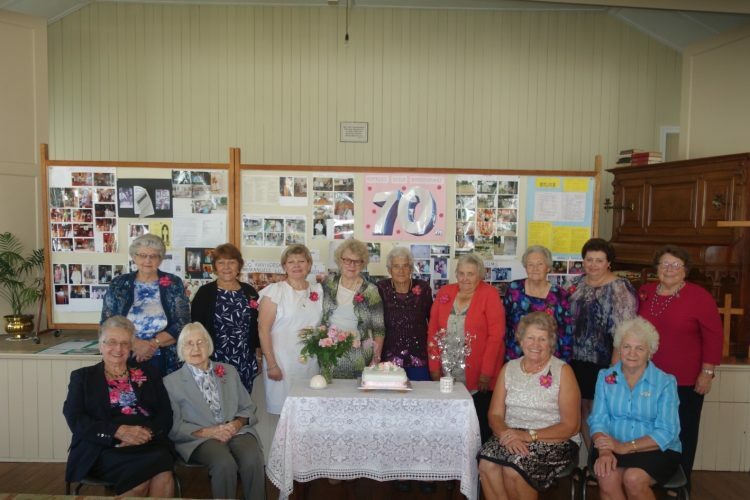 Bev Pile shared the closer walk with God the Highfields Guild now Fellowship, has had since April 1957, they celebrated their 60th Anniversary in April. When their members were younger they were very active with many fund raising street stalls and Garden Parties. Now with no Pastor we will still continue with Bible Studies and our walk with God. Our Saviour’s Toowoomba. Joy Wurst shared that Bible Study was most important as was the fellowship with other g/f also to encourage and value each other and to grow to love each other and to do even little acts of service eg. mending the vacuum cleaner, etc. Joan Ehrlich of St John’s Wilsonton Ladies Guild are very gifted and excel when it comes to most things, like hugs, emergency packs, catering or whatever may be required. Trinity (now closed) Ruth Fritsch, shared as our members are mostly older we ceased as a congregation. I was able to track down minute books 1943, they are written so nicely, others were not so easily read. They always learned a Bible Verse every month. The Theme song was sung once again, Just a closer Walk with Thee (God).Bev Pile gave the general vote of thanks and Ken von Pein gave the closing devotion in this he encouraged us ladies to proclaim the faith, walk closer with God, He is a God who loves, forgives and restores. Rise up in faith walk with Jesus where we are, He will always walk with us – Go on in faith.